Boulder, Colo. (June 14, 2016) — In celebration of 25 years, Life Time Tri Boulder Peak, presented by Voler, and produced by Life TimeSM – The Healthy Way of Life Company announced today a new relay competition open to all athletes in addition to the traditional International distance race. The nation’s fastest athletes will combine forces and descend upon Boulder in July for their shot at winning $25,000 – one of the world’s largest multisport relay purses. Top female and male relay teams will each earn $8,000, with payouts to the next two fastest teams of $3,000 and $1,500 respectively. This is an open competition, and each relay team must be comprised entirely of women or men. One person will represent each team within the swim, bike and run disciplines along the existing Boulder Peak course. Also in celebration of 25 years of the Life Time Tri Boulder Peak, ‘Average Joe’s’ or all non-elite athletes, can form their own relay team and take part in the fun for as little as $25 each or $75 per team if they register before Friday, July 1, 2016. Average Joe relay teams may consist of two or three individuals of any gender, and assigned to one of 10 unique divisions including Families, Foodies, Breweries, etc. One person will represent each team within the swim, bike and run disciplines along the existing Boulder Peak course. Following the Awards Ceremony, all participants will have their own shot at earning $25,000 in assorted prizes from Jaybird®, Panasonic®, Voler®, 2017 race entries, gift cards and more. The traditional International distance triathlon along with the Olde Stage King/Queen of the Mountain Competition will be taking place in addition to the relay competition and registration is still open for athletes looking to compete as an individual in the legendary race. Registration is currently open for both individuals and relay teams at www.boulderpeaktri.com. The special rate of $75 per relay team is available until Friday, July 1, 2016. Early registration is encouraged for all divisions, as the race is expected to sell out. 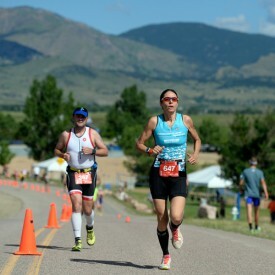 The Boulder Peak Triathlon began in 1992 with 400 competitors. Today, athletes from around the world travel to Boulder to compete in a race often referred to as one of the nation’s best International distance triathlons. At the heart of America’s endurance epicenter in Boulder, Colorado, athletes swim in the Boulder Reservoir, test their cycling prowess up the steep Olde Stage Road and run along the Boulder Reservoir Dam Road with breathtaking views of the Rocky Mountains. Life Time is a privately held, comprehensive health and lifestyle company that offers a personalized and scientific approach to long-term health and wellness. Through its portfolio of distinctive resort-like destinations, athletic events and corporate health services, the Healthy Way of Life Company helps members achieve their goals everyday with the support of a team of dedicated professionals and an array of proprietary health assessments. As of June 2016, the company operates 119 centers in 26 states and 35 major markets under the LIFE TIME FITNESS® and LIFE TIME ATHLETIC® brands in the United States and Canada. Additional information is available at www.lifetimefitness.com.